I have spent the past few weekends migrating the first site I ever created on the WordPress platform to a new web host. 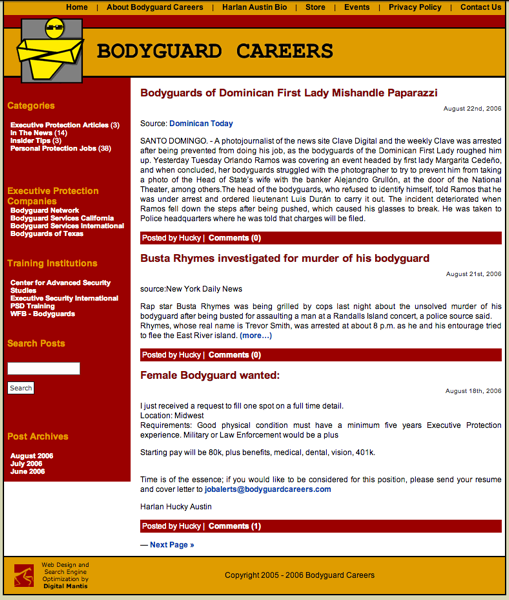 The site is Bodyguard Careers and had plateaued in traffic earlier this year, before Google’s Penguin update. 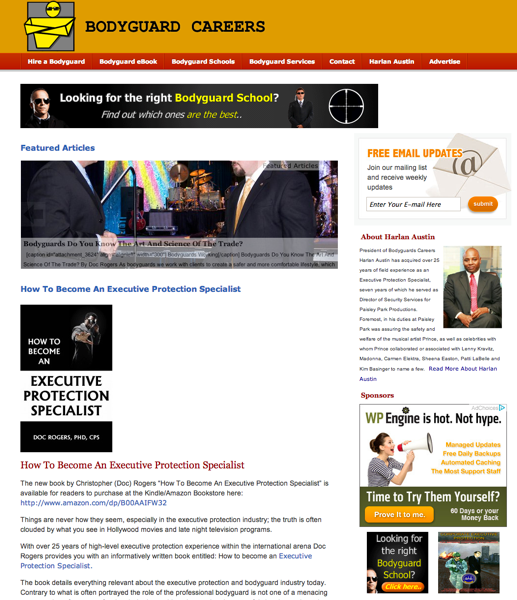 This site has gone through a lot since Hucky Austin and I founded it in 2005 – industry recognition, Featured videos on Fox News and NBC’s TODAY show, #1 ranking for the word “bodyguard” and “bodyguards” on Google, revenue from AdSense, eBooks, lead generation, affiliate programs and much more. Not bad for a website that both of us operate during our free time. Especially for a site I thought was far too niche to draw any visitors. It took a lot of convincing by Hucky for me to even take on the project. Earlier this year it became apparent that the site was starting to lag behind compared to other modern websites on the WordPress platform. This isn’t hard to believe, because we have not taken the site through a complete overhaul at any point since we started it in 2005. Sure, we had changed hosts from JaguarPC to BlueHost to Hostgator and given our template a “refresh” several times to make it look more current, but we were still working off the same fundamental baseline we started with using WordPress 1.5.x. A lot has changed since WordPress 1.5, and I will soon get into that, but first let’s reflect on how long this site has been on WordPress. Let’s start with the #1 song when we first downloaded WordPress: Candy Shop by 50 Cent. This definitely takes me back to a more innocent time. My day job was in HR at the Minneapolis Public School District and at the time I had a choice between Nucleus, WordPress and MoveableType as a platform for the blog (I quickly ruled out hosted solutions like Blogger and TypePad). I installed all three of them onto a server to see which one worked better and WordPress quickly won out because it was so easy to use, understand and configure as a blog AND a website. This was a big revelation for me, because at the time I didn’t even think about using the blog platform as a full-out CMS. WordPress has been my CMS of choice ever since! 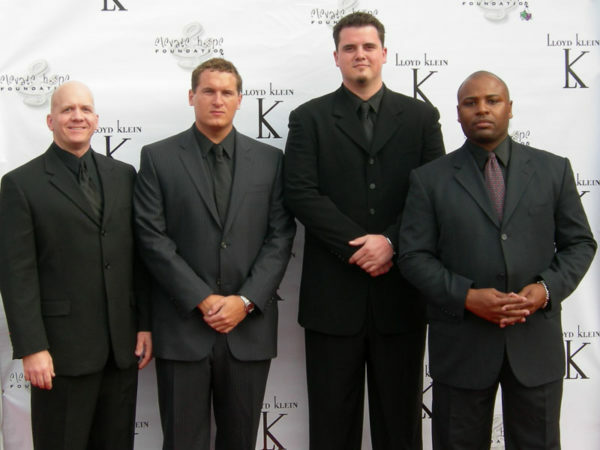 By mid to late 2005 Bodyguard Careers was created and ready to go. From there, it survived the upgrade to WordPress 2.0 (after many tweaks to the template to get it to work), and since then it has thrived on the WordPress platform through several major releases of the product. Sometimes I updated the site and template to include new functionality, but other times I did not do as good of a job (shame on me, I know). 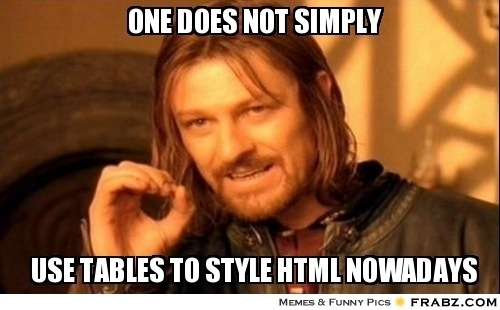 For example, the template did not allow for Widgets until far too late. The site continued to grow in traffic and notoriety, so we must have been doing something right! Especially for a niche that I wasn’t sure existed until Mr. Austin asked me to trust his judgement that day. But then traffic started to decline and we started making preparations to modernize the site to use the most up to date technology, plugins and frameworks for WordPress. This was essentially a complete overhaul of everything we have built up over the years. It was time to start over from scratch. Rather than get into details on each piece we changed, I thought it would be fun to summarize what we did in 2005 and how it has changed over the years. 2013: We now proudly use the Genesis website framework as the backbone for our site, with all CSS customizations either hand coded or done using the Genesis control panel. 2005: We started off using a shared host on cPanel called JaguarPC. They were good to us over the years, but we did run into some scalability problems at times. For example, the time I was computer-less in rural Iowa and Fox News ran an interview with Hucky and our website address right in the byline. After the first airing of the segment, the website crashed entirely due to an influx of traffic… and remained down for several hours while I frantically tried to contact the host about fixing the issue. I was reminded of this fact every hour, on the hour, when the segment re-ran throughout the day. We have used several other hosts over the years, each with the promise of being a better fit for our needs. Some were great, but none of them really gave me the sense of security until I found WpEngine. 2013: I have begun to migrate many of my WordPress sites over to WPEngine.com, because they offer the things that I don’t want to deal with: Better WordPress security, fast loading pages and the ability to meet our bandwidth needs in the event that the site receives an influx of traffic. 2005: We used the vanilla comments system in WordPress and while it has served our purposes for over 3,000 comments, it is also the source of SPAM – to the tune of 500,000+ comments protected by Akismet to date. Along the way, WordPress commenting became better – with threaded comments, gravatars and more becoming available to use. 2013: We have decided to move away from WordPress native comments and use the Disqus comment system to handle our needs. This will allow us to take advantage of upgrades through a plugin vs. within a template and also reduce SPAM comments significantly, since you need to sign up for an account in order to comment. Accounts = real people = less SPAM. 2005: Everything was hard coded into the sidebar. In fact, I can’t even guarantee that the first sidebar of the website used CSS. It’s very possible that I used HTML tables to create the sidebar. I also pasted in AdSense code wherever I could find room and built category and archive links by hand. What a mess. Somewhere along the way, all of the needs to hand code sidebars were replaced by widgets to get the job done, minimizing the need for code on the sidebar. 2013: Not a single line of code is in our Sidebar. It’s all configured in WordPress using a combination of widgets, menus and plugins. This is probably my favorite part of all of the updates we have made. 2005: If there was a viable contact form plugin in 2005, I wasn’t aware of it. The form was a hand-coded HTML form that used a PHP script to mail out the results from the form and submit them to a database. 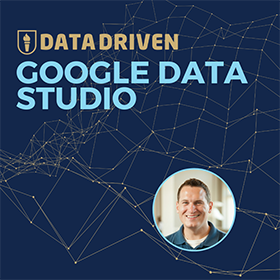 The database was custom coded, validation hand coded and much more. The emails were barely deliverable past spam filters and these forms were a huge security risk! Even worse is that I had them residing outside of the WordPress install, because you wouldn’t execute PHP code within WP at the time (or at least I didn’t know how to). Somewhere around WordPress 2.5 I found cformsII, a free and powerful plugin that did everything I wanted in a contact form and much more. These forms were spectacularly ahead of their time and I appreciated that they were free as well. I still use it on some sites, but my biggest problem is that it’s a bear to upgrade. At upgrade, any customizations had to be re-implemented or re-styled for it to work. I started to become fearful that upgrading the plugin would break my site in a way I couldn’t repair. 2013: I have gradually migrated sites over to Gravity Forms, which is a premium plugin. It offers all of the functionality as cformsII, but with more native WordPress integration, a safer feeling of confidence and cool integrations with contact management systems like Mailchimp. 2005: We used a tool called awstats and it was log file based. It is also awful if you want to actually have confidence in what you are seeing. 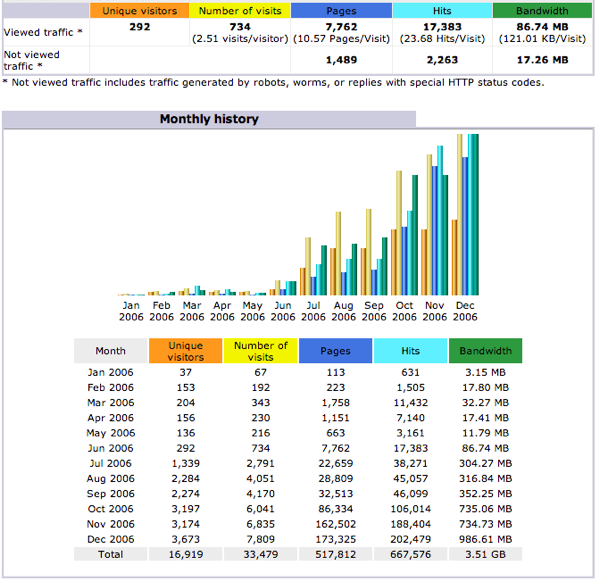 2013: We have been using Google Analytics on the site since 2007, and it has grown with us. 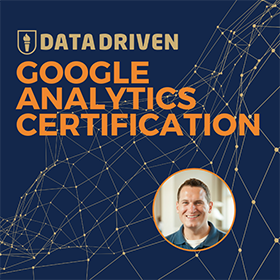 You may have noticed, but I’m a pretty big fan of Google Analytics, and I don’t think I need to get into much more detail other than to say it’s awesome! There are many other things that have changed over the years. From the way I send out emails to the way we manage media, WordPress has improved significantly over the years. When we first decided to roll the dice on WordPress vs. the other available options, I wasn’t sure how long it would last as our platform of choice. Now I’m not sure what we would do without it? 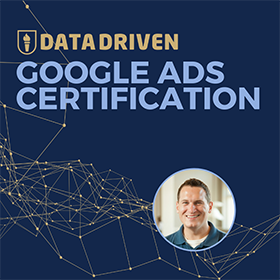 I especially want to thank Matt Mullenweg, Andrew Nacin and crew for creating the easiest to use and most flexible platform on the planet! 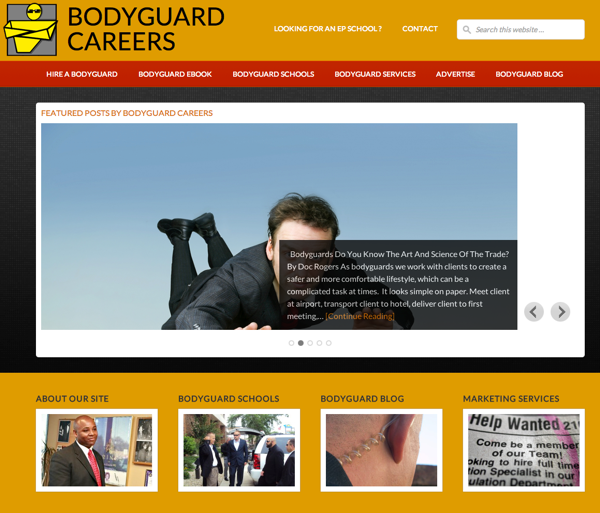 And here is what we came up with – the new face of Bodyguards on the Web! How long have you been with WordPress? Do you have similar experiences and have you enjoyed the way the project has evolved?